The RODE TX-M2 is a digital wireless microphone that transmits audio over distances of up to 328' to compatible RODE receivers. With its 140 dB SPL and frequency response of 35 Hz to 20 kHz, the microphone provides out-of-the-box functionality for singers, presenters, and DJs, working well for live shows, conferences, special events, ceremonies, and more. The microphone achieves 128-bit encryption over its 2.4 GHz fixed frequency agile technology to establish a secure transmission. A diversity antenna mounted on the bottom ensures its long-distance range. Boasting low handling noise that mitigates unwanted rumble, the microphone also sports relatively easy-to-use controls, such as a mute switch and a pair button for one-touch pairing with compatible receivers. Compatible receivers can be found in the RODE Newshooter Kit, Filmmaker Kit, or, if you're looking to assemble your own system, the RX-CAM receiver. 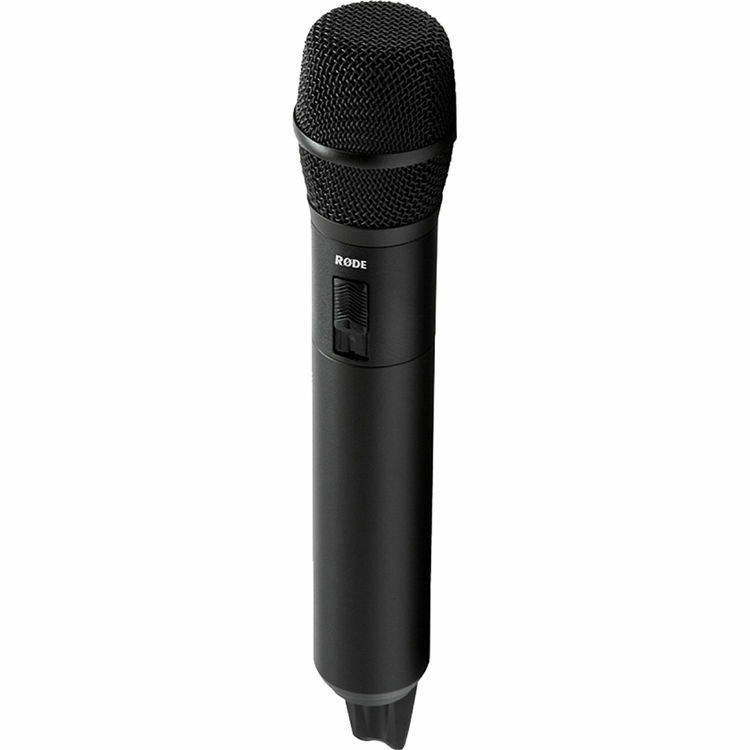 The mic is powered with the included LB-1 lithium-ion rechargeable battery, or by means of two AA batteries, which you can purchase separately. The LB-1 is rechargeable over USB, and a micro-USB cable is provided for this purpose. Box Dimensions (LxWxH) 14.0 x 6.6 x 2.89"
TX-M2 Handheld Wireless Microphone is rated 5.0 out of 5 by 2. Rated 5 out of 5 by Darryl from Great Mic This mic sounds great. I mostly use it for run and gun with various DSLR cameras (Canon and Sony) and very pleased with the performance. Easy to pair and great battery life. Rated 5 out of 5 by Kenny from TX-M2 Wireless Microphone I absolutely love this new microphone. It works great with my Rode Filmmaker Wireless Kit. I recommend this mic for anyone doing podcasts, interviews, etc. How far from subject can mic be placed from subject before too much noise? Hello Kevin, the TX-M2 transmitter operates up to 100 meters/328 feet. Note that this is under perfect conditions and best practices include good line of sight, limiting WIFI interference, and keeping a well charged battery.